If there is a move in your future, you can count on our Modesto movers for top-quality service. Our professionally trained student-athlete movers, moving concierge, and Princess Packers are prepared to get you safely moved into your new home. Whether you’re moving homes for a new job or to enjoy the a change of scenery, you’ll want to check out what our Modesto movers have to offer. Modesto is a welcoming city located in the heart of California and is well-known in the wine industry. There are many reasons to move to the area, but the city’s culture might be the best one. From Modesto’s neighborhoods to its vineyards, there’s nowhere quite like it. The Ernest and Julio Gallo winery, opened on the same day that prohibition ended, has made Modesto famous. This winery is now the largest in the world and employs thousands of people in the area. In addition to great wine, Modesto is also home to dozens of galleries, music venues, theaters, museums and recreation centers. One of the city’s most iconic landmarks is the Flower Clock. A striking timepiece, the clock is planted with new, seasonal flowers every few months to delight passersby. The city is also home to many public parks and boasts beautiful urban forestry. The city is also home to the historic McHenry Mansion and the oldest junior college in the state. In addition to boasting a wealth of outdoor recreation, arts, and culture activities; Modesto also offers an excellent economy. The city is focused on development and growth. Many big companies are attracted to Modesto thanks to the reputation of the local workforce as hard-working, passionate and career-minded. For those moving to the area this means excellent job opportunities. When you choose Meathead Movers as your Modesto movers, you can rest assured knowing that you’re working with the most reliable movers in the state. All our employees are clean-cut student-athletes who are dedicated to providing you with superior service. In fact, when they’re not carrying your boxes, our employees jog to ensure that your job gets done as quickly as possible. Our friendly office staff uses proprietary software to keep track of your precious possessions during every leg of their journey. We offer local, long-distance, and commercial moving services and are even happy to have our Princess Packers get your possessions packed and ready for the big move. To bring extra value to our California customers, we even offer our distinctive moving concierge service to help connect you with local service and utility providers. Modesto is known for being a hospitable and warm-hearted city. Those who are moving to Modesto will find friendly neighbors, business owners, and civic officials eager to welcome them. We are here to help make your transition to this city as easy and stress-free as possible. 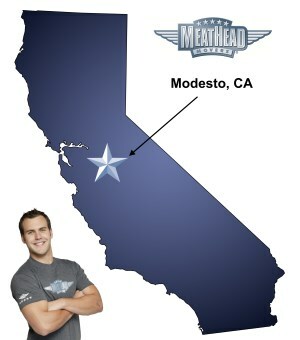 Call Meathead Movers today to find out what we can do as your Modesto movers and to get a no-cost move quote. Moving to Modesto? Here are some helpful resources. Very professional...friendly and competent. Would highly recommend these men to anyone who needed help moving. Thanks for the excellent service and will be calling again this spring or summer with another project we have in our garage.